Since Christmas is a time of giving, a group of bloggers worldwide brings to you Georyl’s Christmas Giveaway. 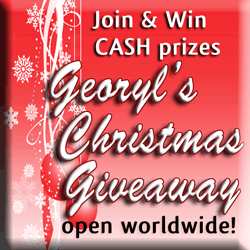 Join GEORYL’s Christmas Giveaway and be one of the 22 winners of cash prizes. Plus three bloggers will get a chance to win blog makeovers. Like the Facebook Pages of the sponsors listed in the Rafflecopter widget below. Follow the Twitter accounts of the sponsors listed in the Rafflecopter widget below. Join the blogs of the sponsors listed in the Rafflecopter widget below via Google Friend Connect (either with your Twitter, Google or Yahoo account). Blog about GEORYL’s Christmas Giveaway to earn 100 additional points per post in the raffle. You can enter up to 3 blogs for a total of 300 additional points. In addition, each post will be your entry to a special draw for the special prize (three free blog makeovers). The contest will end on December 23, 2011. Winners will be announced at GEORYL and notified via email on December 25, 2011. Since prizes will be awarded via Paypal, a valid Paypal account is needed to claim cash prizes. Good luck and enjoy! Advanced Merry Christmas everyone!